NO SALES TAX ON LEASE ONLY! Corolla LE Mdl 1852. Example stk#15305. $189/MO Closed end 36 mo lease. $3999 due at signing includes 1st month & down payment, no security deposit with approved credit. Net capitalized cost $17241.27. MSRP $20,375. Lessee responsible for maintenance, excess wear/tear & 15¢/mi over 12k mi/yr. Early termination fees apply & are determined by the time remaining on lease contract. Payment delinquency fees apply within 10 days after lease monthly payment date. Payments based on $13.89/$1000 borrowed with approved credit. Excludes TT&L, registration, insurance & $150 dealer fee. Ends 4-30-19. 1.9% Annual Percentage Rates (APR) for 72 months. 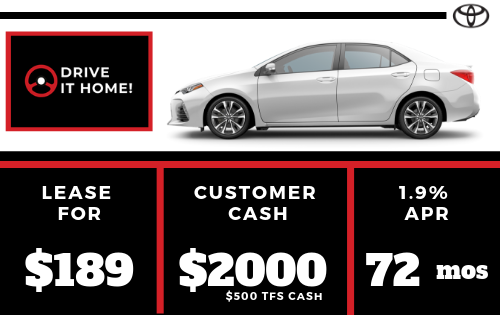 AVAILABLE TO QUALIFIED CUSTOMERS who finance a new 2019 Corolla through Toyota Financial Services. Higher rates apply for customers with lower credit ratings. Specific vehicles are subject to availability. APR may not be combined with any other Customer Cash or lease offers. Monthly payment for every $1,000 financed is $16.67. Must take retail delivery from dealer stock. Dealer sets final actual price. Offer valid 4-2-19 through 4-30-19 in AR, LA, MS, OK, TX only. Contact participating dealer for details. Dealer doc fee $150. 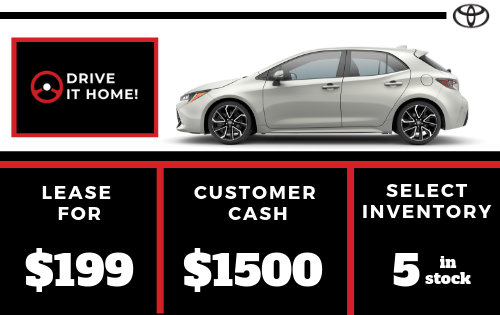 $500 TFS Cash toward down payment on a new 2019 Corolla. TFS Cash is not available with special APR or lease offers. Must finance through TFS and must be used for down payment on a new 2019 Corolla. Must take delivery from dealer stock. Dealer sets final price. Offer valid 4-2-19 through 4-30-19 in AR, LA, MS, OK, TX only. Contact participating dealer for details. Standard APR rates apply and not all customers will qualify. All prices plus tax, title & license with approved credit. MSRP includes delivery, processing, and handling fees. Dealer doc fee of $150 not included in the price. We are not responsible for typographical, technical, or misprint errors. Prices do not include dealer installed options or equipment. Please contact us directly via phone or email to verify all information. While great effort is made to ensure the accuracy of the information on this site, errors do occur so please verify information with a customer service rep. This is easily done by calling us at (512) 359-3708 or by visiting us at the dealership. Corolla Hatchback Mdl 6273. Example stk#15385. $199/MO Closed end 36 mo lease. $3999 due at signing includes 1st month & down payment, no security deposit with approved credit. Net capitalized cost $17804.51. MSRP $21,298. Lessee responsible for maintenance, excess wear/tear & 15¢/mi over 12k mi/yr. Early termination fees apply & are determined by the time remaining on lease contract. Payment delinquency fees apply within 10 days after lease monthly payment date. Payments based on $13.89/$1000 borrowed with approved credit. Excludes TT&L, registration, insurance & $150 dealer fee. Ends 4-30-19. RAV4 LE Mdl 4430. Example lease stk#15005. Closed end 36 mo lease. $249/mo with $3999 due at signing. Net capitalized cost $23569.25. MSRP $26,919. Lessee responsible for maintenance, excess wear/tear & 15¢/mi over 12k mi/yr. Early termination fees apply & are determined by the time remaining on lease contract. Payment delinquency fees apply within 10 days after lease monthly payment date. Payments based on $13.89/$1000 borrowed with approved credit. Excludes TT&L, registration, insurance & $150 dealer fee. Ends 4/30/19. No security deposit with approved credit. * Drivers should always be responsible for their own safe driving. Please always pay attention to your surroundings and drive safely. Depending on the conditions of roads, vehicles, and weather, etc., the system(s) may not work as intended. See Owner’s Manual for details. NO SALES TAX ON LEASES ONLY! Camry Mdl 2532 LE. Example lease stk#14786 $259/mo. Closed end 36 mo lease. $3999 due at signing includes 1st month & down payment, no security deposit with approved credit. Net capitalized cost $22173.76. MSRP $25,988. Lessee responsible for maintenance, excess wear/tear & 15¢/mi over 12k mi/yr. Early termination fees apply & are determined by the time remaining on lease contract. Payment delinquency fees apply within 10 days after lease monthly payment date. Payments based on $14.27/$1000 borrowed with approved credit. Excludes TT&L, registration, insurance & $150 dealer fee. Ends 4/30/19. 1.9% Annual Percentage Rates (APR) for 60 months. 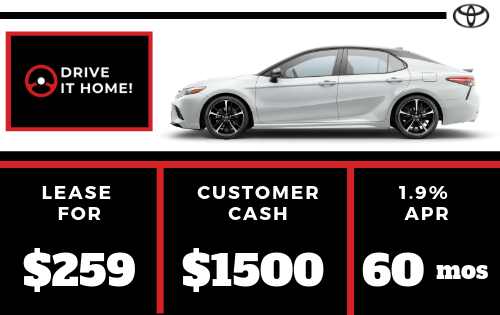 AVAILABLE TO QUALIFIED CUSTOMERS who finance a new 2019 Camry through Toyota Financial Services. Higher rates apply for customers with lower credit ratings. Specific vehicles are subject to availability. APR may not be combined with any other Customer Cash or lease offers. Monthly payment for every $1,000 financed is $16.67. Must take retail delivery from dealer stock. Dealer sets final actual price. Offer valid 04/02/19-04/30/19 in AR, LA, MS, OK, TX only. Contact participating dealer for details. Dealer doc fee $150. Tacoma TSS Mdl 7186: $279 / for 36 Months months / with $0 DUE AT SIGNING. NOT ALL CUSTOMERS WILL QUALIFY. Security deposit required with exception of prior Toyota Financial Services (TFS) financing history and/or TFS tier rating in which a security deposit may be waived. Tax, title and license are excluded. MSRP $32,601, including delivery, processing and handling, and NET CAPITALIZED COST of $30298.22. Excludes official fees, taxes and dealer charges. Customer is responsible for disposition, excess wear and tear fees and $.15 per mile over 12000 miles each year. Dealer participation may affect final negotiated price and applicable taxes. Monthly payment may vary depending on final price of vehicle and your qualifications. Must take delivery from dealer stock. Dealer sets final price. Ends 4/30/19. See dealer for vehicle and lease program details. Dealer doc fee $150. 1.9% Annual Percentage Rates (APR) for 60 months. 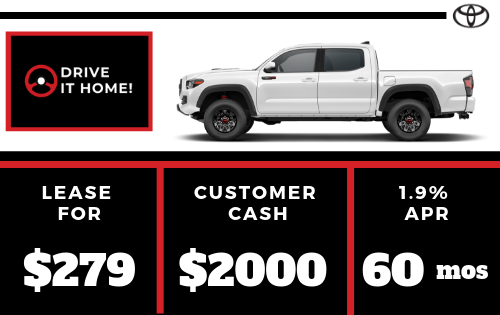 AVAILABLE TO QUALIFIED CUSTOMERS who finance a new 2019 Tacoma through Toyota Financial Services. Higher rates apply for customers with lower credit ratings. Specific vehicles are subject to availability. APR may not be combined with any other Customer Cash or lease offers. Monthly payment for every $1,000 financed is $16.67. Must take retail delivery from dealer stock. Dealer sets final actual price. Offer valid 4-2-19 through 4-30-19 in AR, LA, MS, OK, TX only. Contact participating dealer for details. Dealer doc fee $150. Largest Highlander Inventory In Greater Austin! Come Visit Your Highlander Headquarters Today! Highlander LE Mdl 6942: $289 / for 36 Months / with $3999 DUE AT SIGNING. NOT ALL CUSTOMERS WILL QUALIFY. Security deposit waived. Tax, title and license are extra. Based on Model 6942, TOTAL MSRP $33,307, including delivery, processing and handling, and NET CAPITALIZED COST of $28843.22. Excludes official fees, taxes and dealer charges. Customer is responsible for disposition, excess wear and tear fees and $.15 per mile over 12000 miles each year. Dealer participation may affect final negotiated price and applicable taxes. Monthly payment may vary depending on final price of vehicle and your qualifications. Must take delivery from dealer stock. Dealer sets final price. Ends 4/30/19 in AR, LA, MS, OK, TX only. See dealer for vehicle and lease program details. 1.9% Annual Percentage Rates (APR) for 60 months. 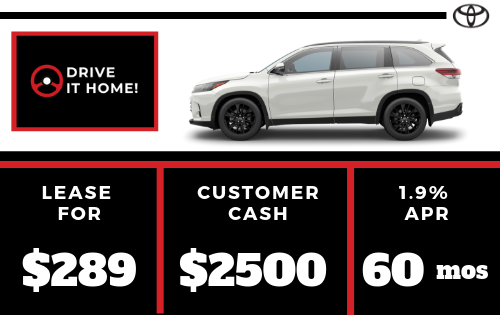 AVAILABLE TO QUALIFIED CUSTOMERS who finance a new 2019 Highlander through Toyota Financial Services. Higher rates apply for customers with lower credit ratings. Specific vehicles are subject to availability. APR may not be combined with any other Customer Cash or lease offers. Monthly payment for every $1,000 financed is $16.67. Must take retail delivery from dealer stock. Dealer sets final actual price. Offer valid 4-2-19 through 4-30-19 in AR, LA, MS, OK, TX only. Contact participating dealer for details. Dealer doc fee $150. Avalon Mdl 3547 XSE. Example lease stk#15389 $389/mo. Closed end 36 mo lease. $5999 due at signing includes 1st month & down payment, no security deposit with approved credit. Net capitalized cost $33091.74. MSRP $40,312. Lessee responsible for maintenance, excess wear/tear & 15¢/mi over 12k mi/yr. Early termination fees apply & are determined by the time remaining on lease contract. Payment delinquency fees apply within 10 days after lease monthly payment date. Payments based on $14.27/$1000 borrowed with approved credit. Excludes TT&L, registration, insurance & $150 dealer fee. Ends 4/30/19. 1.9% Annual Percentage Rates (APR) for 60 months. 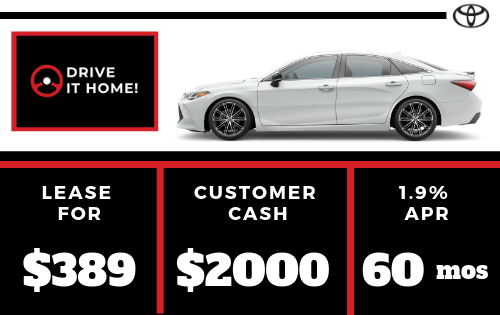 AVAILABLE TO QUALIFIED CUSTOMERS who finance a new 2019 Avalon through Toyota Financial Services. Higher rates apply for customers with lower credit ratings. Specific vehicles are subject to availability. APR may not be combined with any other Customer Cash or lease offers. Monthly payment for every $1,000 financed is $16.67. Must take retail delivery from dealer stock. Dealer sets final actual price. Offer valid 4-2-19 through 4-30-19 in AR, LA, MS, OK, TX only. Contact participating dealer for details. Dealer doc fee $150. 0% Annual Percentage Rates (APR) for 72 months. 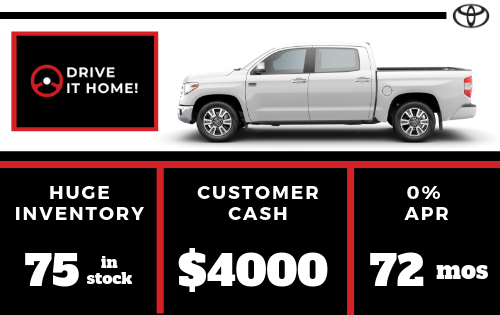 AVAILABLE TO QUALIFIED CUSTOMERS who finance a new 2019 Tundra Special Edition through Toyota Financial Services. Higher rates apply for customers with lower credit ratings. Specific vehicles are subject to availability. APR may not be combined with any other Customer Cash or lease offers. Monthly payment for every $1,000 financed is $16.67. Must take retail delivery from dealer stock. Dealer sets final actual price. Offer valid 4-2-19 through 4-30-19 in AR, LA, MS, OK, TX only. Contact participating dealer for details. Dealer doc fee $150. $1500 Special Edition Bonus enhancement from TMS, GST on a new 2019 Special Edition Tundra. Must take delivery from dealer stock. Dealer sets final actual price. Dealer doc fee $150. Offer valid 4-2-19 through 4-30-19 in AR, LA, MS, OK, TX only. Contact participating dealer for details. Offer Excludes TRD Pro Edition. Toyota of Cedar Park wants our customers to save when they’re thinking about buying a new Toyota. We’re a short trip from the Austin area, but we’re worth the drive!